Production: Indonesia and Malaysia are the world’s largest Palm Oil producers (more than 87%), accounting for 50.23% and 36.98% of world production respectively. Imports: India, China and Europe are the large Palm Oil importers, accounting for 19.05%, 16.55% and 13.93% respectively. Exports: Indonesia and Malaysia are the worlds’ largest Palm Oil exporters (more than 89%), accounting for 46.27% and 43.05% respectively. Production: China, United States, Argentina, and Brazil are the largest Soybean Oil producers (more than 79%), accounting for 25.17%, 20.08%, 17.685 and 16.46% respectively. Imports: China, India, and Europe are the largest importers of Soybean Oil (more than 39%), accounting for 14.72%, 9.81% and 9.20% respectively. Exports: Argentina and Brazil are the largest exporters of Soybean Oil (more than 74%), accounting for 55.52% and 18.49% respectively. 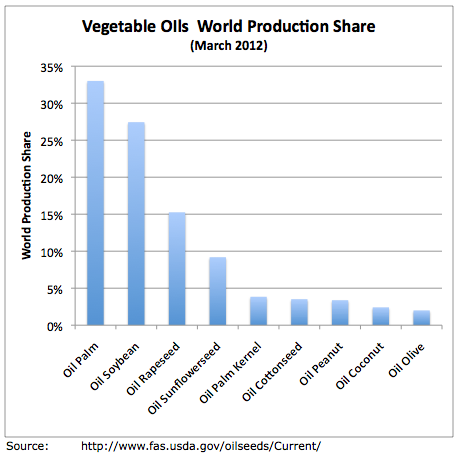 This entry was posted on Friday, April 6th, 2012 at 11:10 AM and is filed under Data, Interesting Charts. You can follow any responses to this entry through the RSS 2.0 feed. Both comments and pings are currently closed.